From its humble beginnings as a small camera store with two employees in 1953, Camera Corner Connecting Point has grown into a business technology leader, employing more than 120 people. Its current location at the corner of Main St. and Monroe Ave. has been in use since 1989, and after 29 years the office areas were due for a complete overhaul. Once on site, the H.J. Martin and Son installers found issues with the underlying floor surface. For starters, existing carpet tile and adhesive had to be removed to get to a fresh surface. In some places, there were as many as four layers of different adhesive. The flooring professionals were required to scrape the adhesive off with ride-on removal machines. Due to the glue causing the machines to gum up, the H.J. Martin and Son team needed to use flour to prevent this from occurring. An additional sub-floor issue was that large areas of the slab were cracked and had sizeable dips. Self-leveling products were poured to address this concern, as deep as 3-inches in some places. Uzin patching/leveling from UFLOOR Systems provided the primary solution to successfully mitigate these issues and flatten out the sub-floor. Starnet was a primary supplier of flooring products for the Camera Corner Connecting Point project. Milliken Fibre 18×36 Luxury Vinyl Tile was utilized in break room areas for its modern look and superior performance. 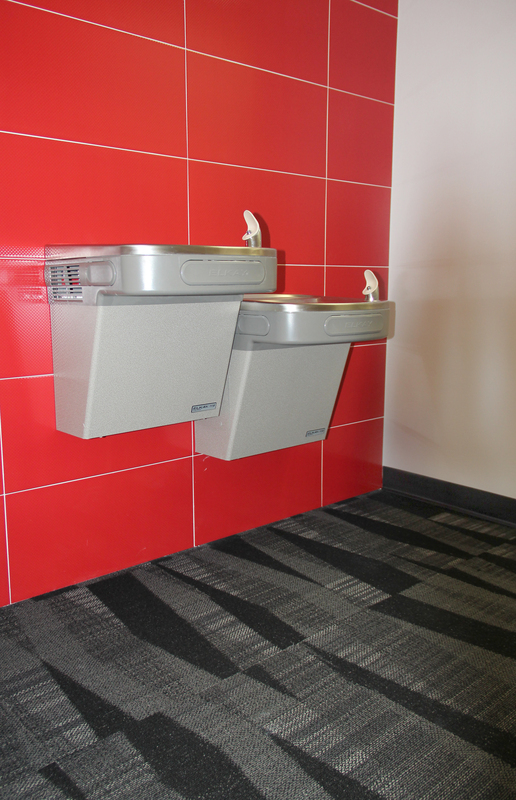 Daltile Showscape™ Reverse Dot Red (ceramic) Tile provided a nice accent on a feature wall, behind water bubblers. Tandus Centiva Angulate 24×24 Ethos® backed carpet tile was the choice throughout the office space for the color palettes it offered, and for its environmental friendliness. Armstrong Imperial Texture Vinyl Composition Tile was chosen for storage space within the office and J+J Runway walk-off 24×24 carpet tile was the pick for a vestibule, in both cases for their performance characteristics. All work was completed over a three-month period from September to November 2016 by a crew ranging in size from 3-6 employees.